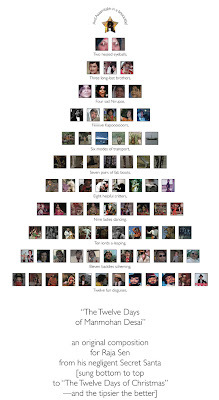 Inspired by Temple's collection in last year's Filmi Secret Santas, I put together a little Manmohan Desai-specific treat for my giftee, Raja Sen. Click on the picture to go to a zoomable pdf on google docs, and be sure to read from the bottom up. and Aaaaaamitabh in a booootttle! Wishing you everything merry and bright, my Bolly loves! Is that Raja Sen who writes for Rediff? Just linked to the Raja SAen review of Tees Maar Khan. Merry Bollywood Christmas. Can't wait to see what the 'woods deliver in 2011. Yep, that's the one! And here's to 2011! That's a pretty awesome gift! Isn't Raja the lucky one. But I guess we all are, since we all get to share. A great 2011 to you! Hey Beth - when will you post the big reveal so we know who to thank for the filmi festive fun?